GTT events primarily consist of five-and-a-half day “modules.” From time to time, we also offer weekend workshops and webinars. A schedule of events can be found here. No prior experience with Holotropic Breathwork is required to attend GTT events (except certification and advanced trainings). For those who wish to become certified HB practitioners, both types of events contribute to your training requirements. Modules: You may participate when you choose, in a residential setting, in groups of moderate size, for one or two modules at a time. You will be with people from around the world who are excited about Holotropic Breathwork and the holotropic perspective, and you will have the opportunity to delve deeper into both the breathwork and your personal journey than is usually possible in shorter workshops. You will also become a part of the larger community of HB practitioners and experiencers. 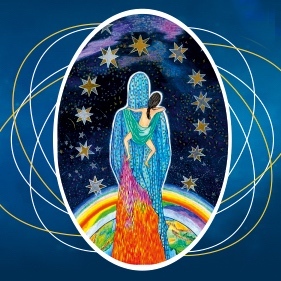 Besides the practice and theory of HB, module topics include Shamanism; The Psychedelic Experience; Addiction, Attachment and Spirituality; Jung’s Red Book; Celtic Shamanism; The Power of Trust & Connection; Movie Yoga; Sacred Geometry; Living with Dying; Archetypes & Astrology; and others. A special event is Ecstatic Remembrance, featuring kirtan (chanting) led by Jai Uttal (twice Grammy nominated). Advanced trainings have included Trauma & Transformation; and Fantastic Art – held at the HR Giger Museum in Gruyeres, Switzerland. WHO SHOULD ATTEND GTT EVENTS? The program is designed to work for people with various levels of interest. If you have been to an HB workshop and would like to learn more, modules offer a great set and setting for a deeper personal journey. Even if you have no prior experience with HB, GTT modules are a great place to start. Although some in the program are in the helping professions, it is in no way a requirement for participation, or to become a practitioner. People with all kinds of backgrounds have attended the training, including business people, artists, academics, ministers, nurses, filmmakers, teachers, body workers, writers, builders, doctors, musicians, veterinarians, attorneys, and more. A training group generally consists of people from many countries, and of varying ages and income levels. There has been limited racial diversity, but we hope this will change. People come from a broad variety of backgrounds, with varied interests, spiritual paths, and reasons for participating. What participants have in common is a passion for Holotropic Breathwork. Based on this, and on taking the inner journey together, groups usually bond quickly, and deep connections are made. WHERE DO TRAINING EVENTS TAKE PLACE? An up-to-date list of all training events offered around the world can be found here. To receive notice of upcoming and future events, you can join our mailing list here.